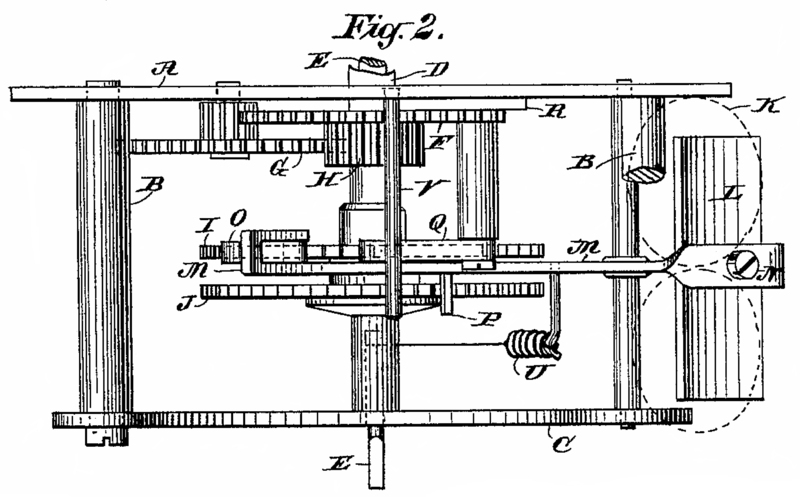 When the telegraph system was just getting going in the early 1800s electromagnets were one of the first components. At that time they typically consisted of a pair of coils wound on iron cores. These were used for Sounders and relays early on. 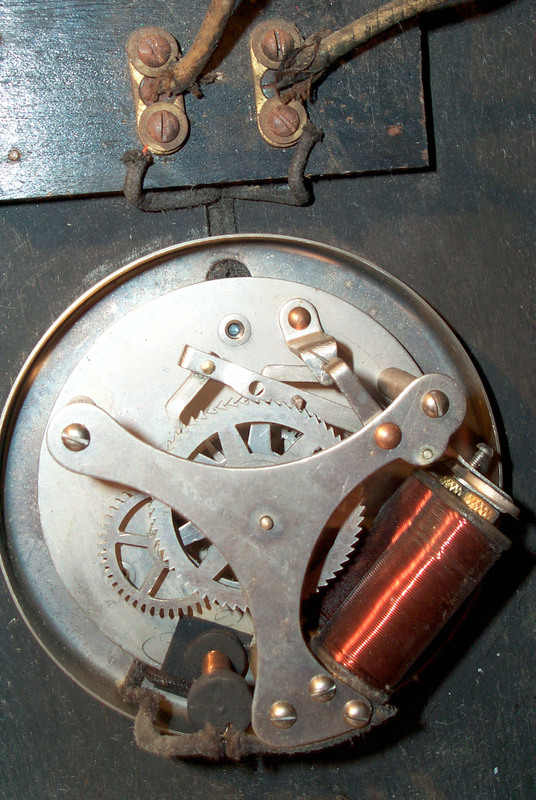 By connecting a pair of coils to an escapement you could turn the type wheel in a stock ticker quotation machine or turn the minute hand of a clock. A pendulum clock would act as a master and drive a number of secondary or slave clocks in public buildings or factories. 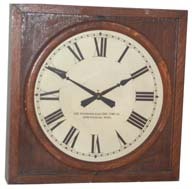 The Standard Electric Time Co. was one of a number that made this type of clock. As received there are a couple of problems. The spring that moves the minute hand is not strong enough. A temporary fix is to add some 3"x5" card stock to put more tension on the spring and this allows the clock to keep time. You can see the spring in the photo at the left held down by the card stock. The glass was not tight. It's held in place by a narrow ring of wood, but all the brads have fallen out. The glass is held in a door that can be hinged up to set the hands manually but only while the electromagnet's armature is manually pressed to free the escapement. By using the smallest brads at the local hardware store and placing them in the existing holes in the wood (Bamboo?) ring the glass has been reattached. If the existing holes were not there it would be necessary to drill new clearance holes since driving a nail into this wood would surly split it. Inductance 390 mH, Resistance 10 Ohms, pull in current 260 ma, drop out current 30 ma. This is with a small piece of 3x5 card stock adding tension to the spring. Without adding tension the clock will not move the hands, but with the card the clock keeps time and the pull in current is about 60 ma and drop out current is 10 ma. Note that from Ohms Law 10 Ohms times 260 ma is 2.6 volts so you might expect that clock to operate on a 3 volt power supply and it will. But if you have a number of clocks all connected in series then for each added clock another 3 volts will be needed. The time constant for a circuit with inductance and resistance is T = L / R, so for this clock that's .39 H / 10 Ohms = 0.039 seconods or about 40 ms. It takes about 3 to 5 time constants for the value to settle so let's say it's in the 0.1 to 0.2 seconds area. Maybe a little slow, but still much shorter than a minute. 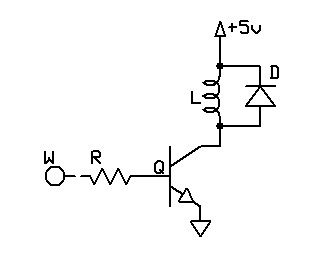 The turn on time can be shortened by placing a resistor in series with the circuit (see 13 May 2007 below). When the current is stopped the coil generates a voltage spike that's opposite in polarity from the polarity when the coil was powered. A common way to protect a transistor that's driving a relay is to place a diode across the coil with the diode back biased during normal drive so that when the voltage spike happens it will be shorted out in the diode. This same method will keep the points in a mechanical clock from arcing. This will slow down the time it takes to discharge the coil. The time constant is the same as calculated above or about 0.1 to 0.2 seconds. So even when these are added toghther they are still much less than a minute. For applications like Teletype machines or Stock Tickers where you need speed the snubber diode can not be used. There are two ways the slave clocks could be connected, in a Series loop or in Parallel. A major concern was a way to prevent arcing when the master clock opened the circuit. This was typically done by a relay for each circuit and a large building may have dozens of circuits and hundreds of clocks. The Series connection allows each movement to be tuned then a shunt resistor wound so as to bring the operating current into the 160 to 180 ma range. Then all the clocks in a circuit have the same current and so operate reliably AND the shunt resistors act as snubbers to prevent arcing of the relay points. As current goes into an electro-magnet it charges the magnetic field. If the current is stopped the magnetic field collapses generating a current in the opposite polarity but starting out at the same value. If there is no snubber circuit across the coil the voltage can be very high. This causes arcing on the mechanical points controlling the current input, wearing out the points. By placing a resistor in parallel with the coil about five to ten times the coil resistance the voltage across the coil at the start of the back EMF will be five to ten times the normal coil voltage and so eliminates the point arcing problem. The early shunt resistors were made in the form of a coil wound on a non magnetic core where the wire gauge and length determined the resistance. Note the skinny coil in the above photos that has it's long axis front to back. Newer versions use a carbon composition axial lead resistor. At first look it appears that there are more more modern snubber circuits than a plain resistor which dissipates power during coil charging. For example spark ignition engines use a capacitor across the distributor points. After the points have been closed for the dwell time just before they open the capacitor is at zero volts. Just after the points open the coil back EMF sees the capacitor at zero volts and so can only generate a voltage across it's own internal resistance (a very low voltage). Industrial relays use a snubber circuit consisting of a resistor in series with a capacitor. But looking further shows there's a second reason why the shunt resistor was used. It's to prevent a whole string of series connected clocks from failing if one clock has an open coil. The same idea as cheap Christmas tree lights. If this clock has a coil resistance of 110 ohms with a shunt resistor of 11 ohms yields a combined resistance of 10 ohms. A 24 volt circuit would have 8 clocks in series and a loop current of 24 V / 80 Ohms or 300 ma. If one coil opened the loop resistance would go up by 100 ohms or to 180 Ohms and the loop current would fall to 133 ma. Which is still way above the 60 ma needed to operate the electro-magnet. I plan to add a driver stage to my Precision Clock so that it can drive secondary clocks. But in the mean time I got a Piexx model IMP-2 Slave Clock Impulser. Note: This Clock Impulser is designed to drive a string of up to 10 clocks. If you are driving only one clock you should place a resistor in series so that the nominal voltage drop across one clock is 1/10 of the total loop voltage. The rate of the clock can be speeded up or slowed down using the input keys. To control the IMP-2 there are two input pushbuttons, Set and Advance. Three status LEDs: Set, Mode and Advance as well as the impulse LED which also acts as a status LED let you know where you are in the menu as well as reading back the current vlaues. 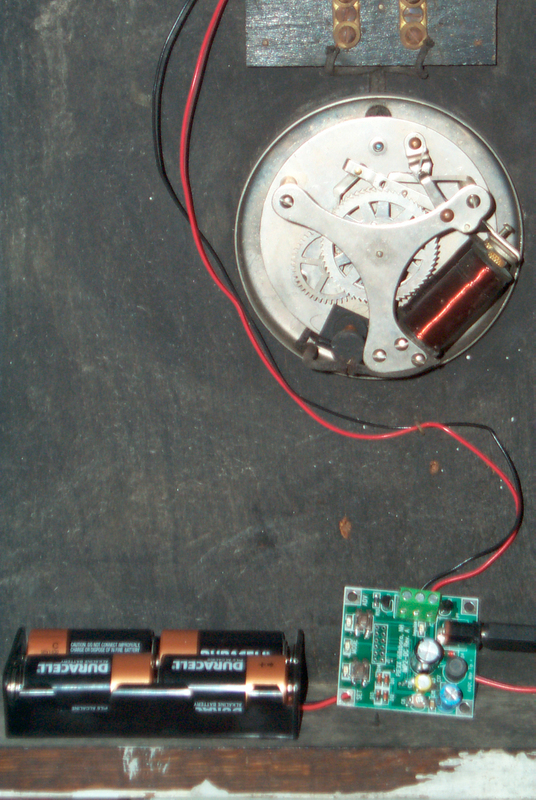 13 May 2007 - The calculations above based on the electrical measurements show that less than 3 volts is needed to drive the clock, yet slave clocks of this type are specified to run in a 24 volt circuit. The reason is that one circuit can have up to 10 clocks. Remember that for each battery added to a system there's both the added cost of the battery and also the added cost of maintenance. So at the time I'm sure someone worked out a minimal cost number of batteries and it came out to provide 24 volts. At any rate the clock was designed to be one of 10 in the loop, so when you drive just one clock in a 24 volt loop a resistor can be added to make up for the other 9 clocks. 9 clocks * 24 volts / 10 clocks = 21.6 volts that needs to be dropped. 21.6 volts / 260 ma = 83 Ohms. I used 100 ohms and it's working. Not only is the clock much quieter but the tick is much crisper sounding. That's consistent with the faster response time. 14 May 07 - 100 Ohms was too high. The clock was not advancing on every pulse. Tried 47 ohms and it too may be too high this morning the clock was 30 minutes slow which probably means missing pulses. The friction is probably too high at the hub where the minute hand is a rod inside a sleeve. I've read not to use oil because it gets gummy in time, but maybe one of the new synthetic oils would work here? But the minute hand now points smartly to the line on the dial without the prior slop. Have used a tiny amount of charcoal lighter fluid wicked between the minute shaft and the hour sleeve to clean that joint. Now the minute hand will spin like a top, which it would not before. I haven't yet received all the literature for this clock. It may be that I need to disconnect the shunt resistor to allow for more efficient operation and that's probably quieter and more precise operation. 19 May 07 - Still something wrong. The minute hand is not advancing on every pulse. 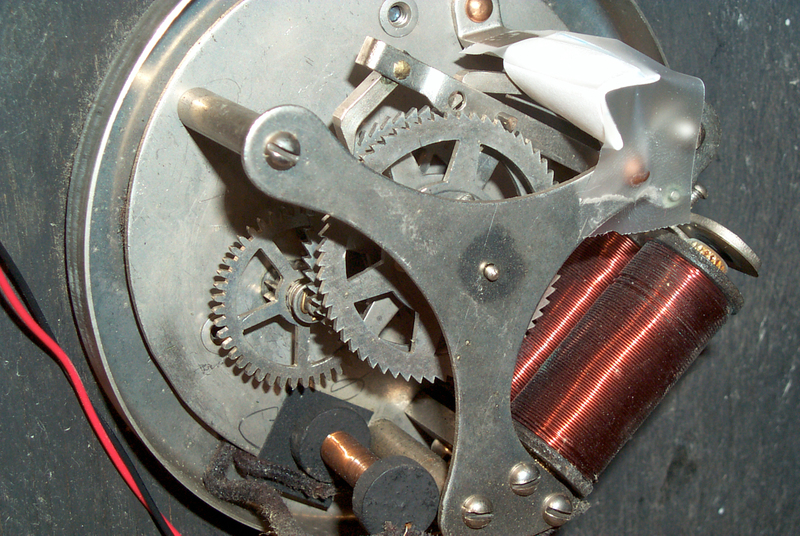 The electromagnet is lifting the pawl, but it doesn't always move the minute hand. Try increasing the thickness of 3x5 card stock on the lever spring wire. 25 May 07 - the "Operation and Adjustment of Non-Resetting Minute Impulse Secondary Clocks (Series or Parallel)" arrived today. And after going thought the four steps the clock appears to be working, but I'll know tomorrow. Now it's the one telling the correct time in the 3 Clocks Photo. 31 May 07 - at 1:08:14 actual time the IMP2 pulsed the SETSC to 1:0:00 pm. So in about 6 days the IMP2 gained 1 min 46 sec or 106 seconds or 17 sec/day. Got lost in the IMP2 menu system. 31 May 07 - 6:00 pm crancked in 7 seconds per day retardation and restarted. Based on the SET publication "Operation and Adjustment of Non Resetting Minute Impulse Secondary Clocks (Series or Parallel)" dated March 1, 1968, TI-1179 Attn: All Salesmen and Field Service Personnel Available from Jeffrey Wood. 1 Adjust or add the Drive Pawl spring. After going through the above steps in order the clock is working fine. 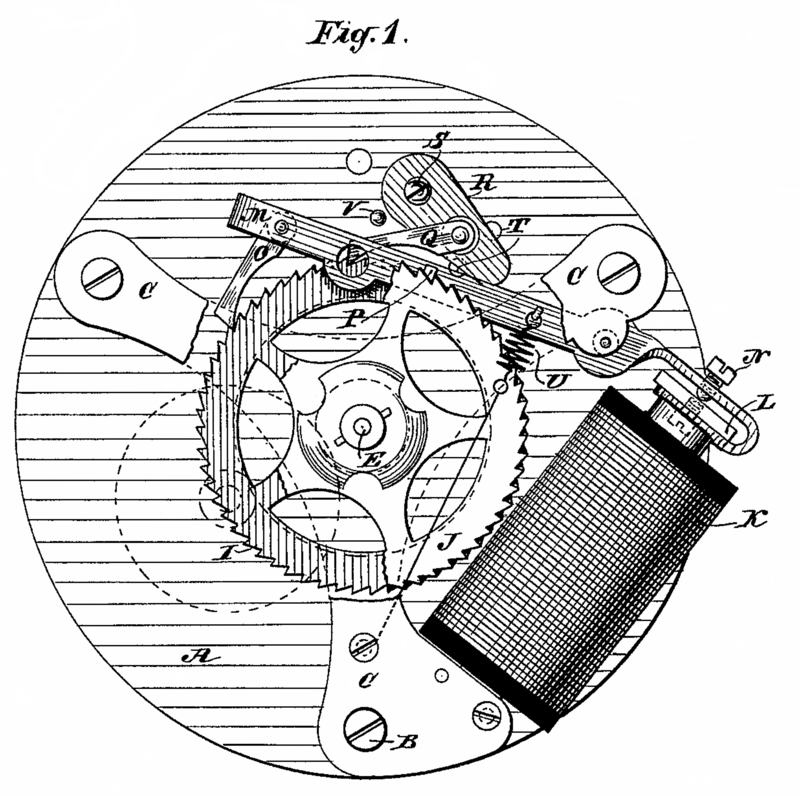 The minute hand is not fixed to the minute shaft, but is coupled by a clutch (see the patent above). At first I thought the reason for the clutch was to allow adjusting the minute hand over a distance less than 1 minute so that it points to one of the minute dial marks. But now see that it allows the minute hand to be set anywhere in the hour simply be lifting the glass and moving the hand manually. When this is done the hour hand follows the movement of the minute hand. Remember that the minute shaft is the start of the gear train and is driven by the electromagnet and locked by the two pawls. When the minute hand is moved it's connected to the gear that drives the hour hand. The minute hand is balanced. The short end has a circular weight attached by a rivet. In the photo you can see the jeweler's screwdriver balanced on the tweezers and the minute hand balanced on the blade of the screwdriver. In the background are the washer with square center hole and the pin used to hold the minute hand on it's shaft. 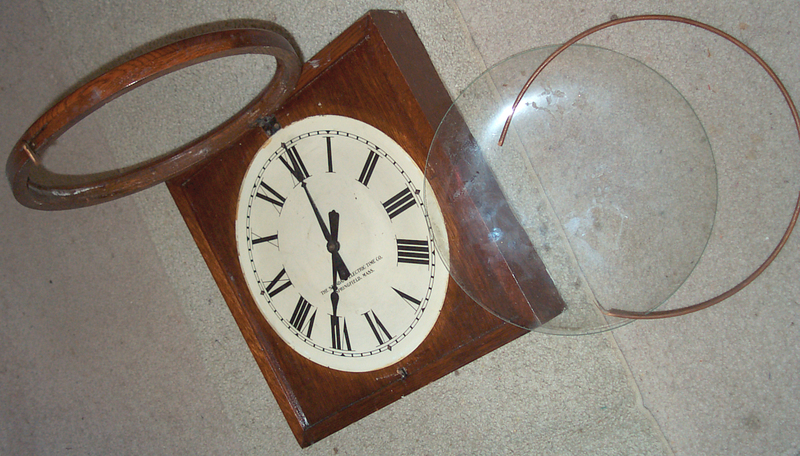 Also on the right is the square wood clock box and on the left the round door since the clock is on it's side. The slop caused by the location of the two pawls can be minimized by rotating the fixed pawl stop support arm. But after doing that I've found that there's additional slop between the minute hand the the square shaft where they are joined. This was fixed using an automatic center punch on the back side of the minute hand where it will not show. The front side was on a hard surface. This worked the metal a little and closed the gap. 1. Position slop of the minute hand. This clock has slop in the minute hand that's 1 full minute wide. That's to say you can move the minute hand back and forth and it covers 1 minute of time. That's way too sloppy. The movement should be say 10% or less of a minute. I'm waiting for the instructions before bending the fixed support pawl arm to tighten up the movement. 2. Power needed to move hands. There now is a resistor (looks like a coil) that shunts the working coils they wasting power. This could be disconnected for single clock use. The shunt resistor is a first generation snubber that absorbes the back EMF when the coil drive current stops. Without the shunt resistor the points in the master clock arc and destroy themselves in short order. 3. Pointing accuracy of minute hand. After the slop is removed the minute hand should point to one of the minute marks on the dial, not between the marks. 4. Stepping Speed. To determine the minimum power needed to move the hands the drive current and/or pulse width is reduced and the clock watched to see if it misses a beat. This can take a very long time so by running the clock at much higher speeds the test time can be shortened. The key feature of the SET clocks is the two wheel escapement as set forth in patent 363440. One of the problems of other escapements is that when there's nearby lighting the clock minute hand moves due to the induced current spike. The SET design does not move. Later patents added hourly setting of both the minute and hour hands using a number of different methods. The earlier methods were noisy during the setting process and later methods not so noisy. The movements that have the hourly setting look very similar to the above except have a second coil on the left making a "V" arrangement of coils. The patent shows item "U" a short fast acting coil spring to pull down the armature arm, but the actual clock uses a wire spring. The patent shows holes "T" near the base of the radius arm base where it mounts to the back of the dial plate to facilitate rotating the radius arm about it's single rivet base to adjust the slop in the minute hand, but the actual clock does not have those holes. Patent line numbers 52 to 58 point out how easy it is to make the stop pawl adjustment by rotating the radius ram about is rivet. Lines 58 to 63 point out that the stop wheel is "movably mounted" to the main shaft so that it can be adjusted. These two adjustments allow both minimizing the minute hand slop and getting it to point on an exact minute boundary dial mark. Although not marked in Fig 2 the clutch disk that movably holds the stop wheel "J" on the minute hand shaft "E" is shown. "N" on the armature is described as an adjusting screw, but it's purpose is not mentioned. 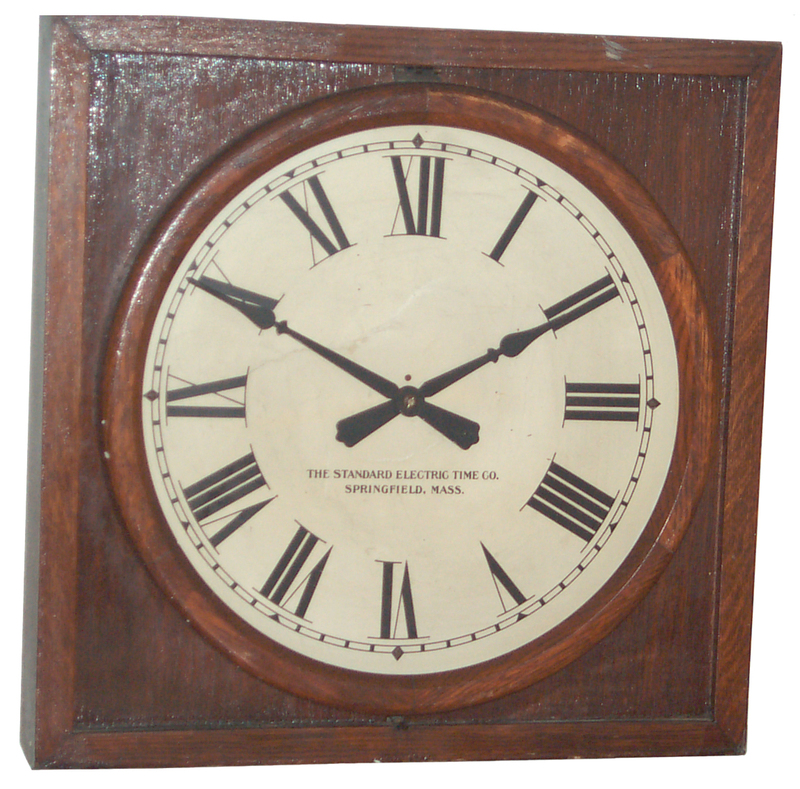 Jeffrey Wood's - Standard Electric Time Collectors’ Photo Gallery - Secondary or Slave Clocks - he also has information sheets for this clock. Well worth the wait, the instructions fixed the clock in one pass. Electric Time® Company, Inc. - Tower & Post Clocks - not the same company?